Okay, so it might not be the cheapest staycation option, but it’s still cheaper than a peak season stay. And it comes with some choice add-ons. With an afternoon tea at Shai Salon, breakfast at Suq and a discount of 15 percent on spa treatments, it might be time to splash the cash. From Dhs2,170 per room, per night. Until August 3. Jumeirah Beach Road, www.fourseasons.com (04 270 7777). A stay at this luxury hotel can be fun for all of the family. Not only do you get prime Downtown views and great service, if you book for three nights, you’ll also get complimentary tickets to Reel Cinemas, Dubai Ice Rink and Dubai Aquarium & Underwater Zoo thrown in, too. Prices vary. Until December 29. Downtown Dubai, www.theaddress.com (04 561 8888). UAE residents are well looked after by Address Hotels + Resorts. Staying in this Downtown property, you’ll get quite the goodie bag. Two complimentary tickets to Reel Cinemas and Dubai Aquarium & Underwater Zoo should be enough to keep your staycation exciting. You also get 20 percent off any of all Emaar Hospitality Group restaurants, which is an extra bonus. From Dhs899. Until September 30. Downtown Dubai, www.theaddress.com (04 438 8888). Staying a little longer is well worth your while at this plush Palm Jumeirah hotel. Not only will you benefit from more time to enjoy one of 293 luxurious rooms, you can also save a few precious dirhams. Stay for three nights or more and you’ll save 15 percent on the cost of your room and get daily breakfast thrown in, too. From Dhs656 per room, per night. Ongoing. Palm Jumeirah, www.anantara.com (04 567 8888). A holiday really should include something special. It’s all well and good camping in the hotel room and enjoying room service and TV for a few days (no, really, that sounds great) but an amazing experience makes it all the better. When you stay for three or more nights at this Dubai Marina spot, you get free tickets to Dubai Parks And Resorts, plus free transportation to and from the theme park. From Dhs600. Until September 30. Dubai Marina, www.theaddress.com (04 436 7777). It might just be the ultimate UAE staycation resort. A true holiday environment that’s cut off from the real world (an underwater kingdom theme will do that for a hotel) but close enough that you don’t need to bother with all the faff of actually leaving the country, Atlantis The Palm throws in plenty of freebies, too. Rooms are large enough for two adults and two kids, and come with free access to Aquaventure waterpark and The Lost Chambers Aquarium. Pay with a MasterCard and get 40 percent off the best available room rate, a further 25 percent off Atlantis’ restaurants, plus ShuiQi Spa deals, too. From Dhs1,054 per room, per night. Until October 15. Atlantis The Palm, Palm Jumeirah, www.atlantisthepalm.com (04 426 1000). The desert tends to be a few degrees cooler than the city, so head out to this luxury hotel. From now until the end of September, every day comes with Dhs350 of credit to spend at the spa, restaurants or swim-up bar. It’s a great time to visit one of the nation’s most luxurious desert hotels. From Dhs850 per room, per night. Until September 30. Al Qudra Road, www.meydanhotels.com (04 809 6100). This Sheikh Zayed Road property is close enough to Dubai’s most popular tourist spots and therefore a great hub from which to explore the city. Though surrounded by skyscrapers, it still manages to feel like the “urban oasis” it markets itself as. It has good relaxation facilities, and with its long-running summer deal (right up until Sunday October 8) offering 20 percent off the best available rate, it’s a good choice for city dwellers wanting a familiar break. From Dhs464 per room, per night. Until October 8. Sheikh Zayed Road, www.conraddubai.com (04 809 6100). From Dhs550 per room, per night. Until September 30. Palm Jumeirah, www.dukesdubai.com (04 455 1111). Highly Commended in the Family Hotel category at the 2016 Time Out Dubai Kids Awards, we can’t think of any reason not to staycay at this hotel. A half-board package means you get a big breakfast at Flow Kitchen and a choice of either lunch or dinner, too. What’s more, a couple of hours’ free play at the Fairmont Falcons Kids’ Club is thrown in for the little ones for good measure. From Dhs585 per room, per night. Until August 30. Palm Jumeirah, www.fairmont.com (04 457 3388). We defy anybody to get bored at this activity-packed resort. It’s summer so you won’t be competing for space at the Wibit Waterpark or for the fitness facilities with European football teams. You will, however, experience 30 percent off rooms, 20 percent off spa treatments and 15 percent off food and beverages. Oh, if you have family in tow, there are free kids’ club and teen zone activities. too. From Dhs459 per room, per night. Until September 30. Jebel Ali, www.jaresortshotels.com (04 814 5555). 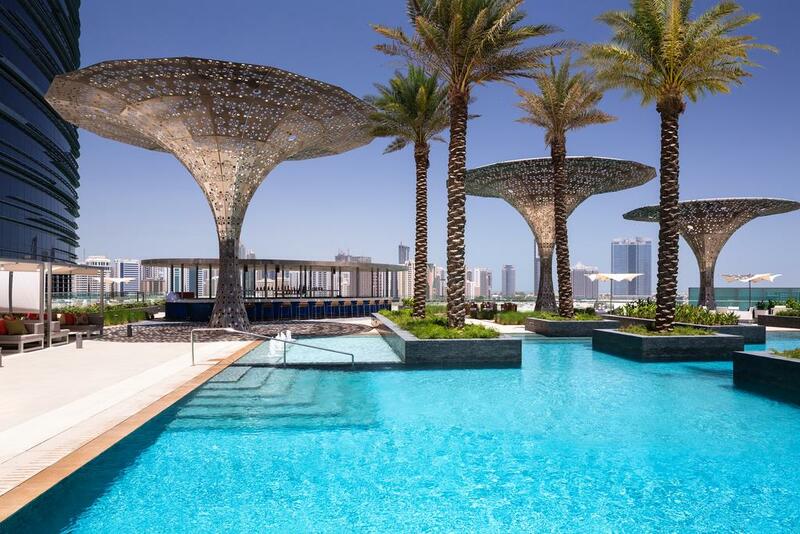 The swimming pool at this Festival City hotel is one of the great hidden gems of Dubai. Glass bottomed, thrust out over the side of the hotel and looking down on the Dubai Creek it is a very cool spot many have admired from afar before. Check in during the summer you can sample for yourself and discuss how great it is while enjoying 20 percent discounts at the hotel’s restaurants later that evening. From Dhs646 per room, per night. Until August 31. Dubai Festival City, www.ihg.com (04 701 1111). Up in the Hajar Mountains, you’ll feel like you’re in another country, just without all that hassle of airports, visas and having to change currency. The popular – and recently revanped – border retreat has 30 percent off mountain-view rooms and 20 percent off food and beverages during your stay. Oh, there’s free wi-fi, too, so pack your Netflix. From Dhs469 per room, per night. Until September 30. Sharjah Kalba Road, Hatta, www.jaresortshotels.com (04 809 9333). The name means sea breeze and that’s what you can expect at the final piece in the Madinat Jumeirah jigsaw. The upmarket hotel will set you back around Dhs3,500 during high season, but this summer, UAE residents can stay for as little as Dhs1,100 per room, per night. Not bad considering you’ll be staying in one of our favourite properties in Dubai and will be able to claim a complimentary dinner at one of more than 60 restaurants, have unlimited access to the nearby Wild Wadi, scoff breakfast at The Palmery and enjoy use of the Talise Spa or Sinbad’s Kids’ Club. From Dhs1,100 per room per night. Until September 30. Madinat Jumeirah, Umm Suqeim, www.jumeirah.com (04 366 8888). UAE residents can stay at the iconic hotel this summer half-board, meaning free buffet breakfast and either lunch or dinner at any of Jumeirah’s hotels – and there is a choice of more than 60 restaurants. Added to that, you’ll get free access to Wild Wadi while the kids can play at Sinbad’s Kids’ Club without you having to shell out any extra dirhams. All this for just Dhs900 per room, per night, excluding taxes. The savings are well worth considering. Dhs900 per night room, per night (minimum three nights). Until December 30. Jumeirah Beach Road, www.jumeirah.com (04 348 0000). For a budget stay at a Jumeirah hotel, take your weekend bag over to this Garhoud property. 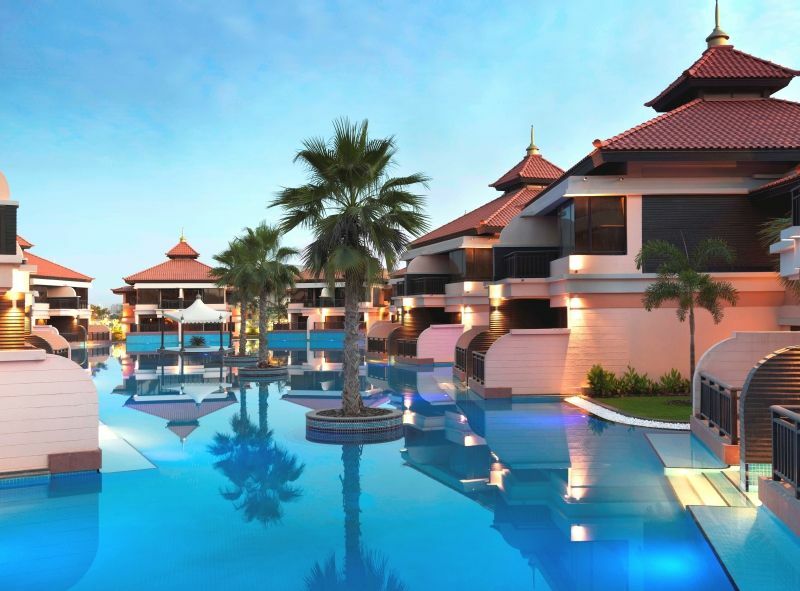 A starting rate of Dhs400 per room, per night is admirable value, considering the price includes Wild Wadi tickets, the opportunity to use Jumeirah Zabeel Saray facilities and even a buffet breakfast and refill of your room’s mini-bar. From Dhs400 per room, per night. Ongoing. Garhoud, www.jumeirah.com (04 230 8555). What better way to combat the summer heat than checking in for a ski holiday? It really makes perfect sense. Stay in an Executive Junior Suite level room or above and you get free access to Ski Dubai and daily breakfast. And if you book for five nights, you’ll also get 25 percent off, or three will get you 20 percent off. From Dhs1,499 per room, per night. Until September 30. Kempinski Hotel Mall of the Emirates, Al Barsha, www.kempinski.com (04 341 0000). This beach hotel is declaring madness this summer in the form of 50 percent off all food, beverages, spa treatments and watersports when you stay at the hotel. From Dhs499 per room, per night. Until August 31. King Salman Bin Abdulaziz Al Saud Street, www.lemeridien-minaseyahi.com (04 511 7771). The Arabian-style hotel with private beach and pretty gardens is the kind of place holidays are made of. And when you book a three-night stay, you get a 40 percent discount. While we’ve always liked the peace and quiet of this hotel it packs in some holiday thrills by handing over complimentary access to Aquaventure waterpark at Atlantis The Palm. From Dhs1,275 per room, per night. Until September 30. King Salman Bin Abdulaziz Al Saud Street, www.oneandonlyresorts.com (04 399 9999). Add a touch of opulence to your summer at this swanky hotel boasting Versace-designed rooms. You’ll get breakfast, lunch and dinner for two adults and two kids, and you can claim discounts on spa treatments bringing the high-end property into the realms of the more affordable. From Dhs1,210 per room, per night (family of four). Until September 30. Culture Village, Al Jaddaf, www.palazzoversace.ae (04 556 8888). 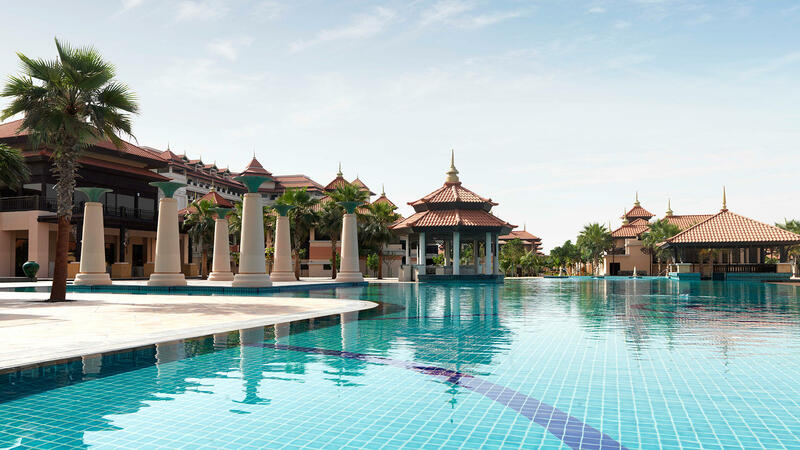 Make a booking at this Palm Jumeirah resort this summer and as well as 20 percent off room rates, you’ll get 25 percent off at all its restaurants and buy-one-get-one free on spa treatments. Now that’s the true spirit of a staycation. From Dhs950 per room, per night. Until September 30. Palm Jumeirah, www.sofitel-dubai-thepalm.com (04 455 6677). Media One Hotel has just launched what could be the deal of the summer. In short, the deal looks like a free night in a very chic, modern hotel – and it’s being marketed as a “stay for free” rate. For the summer months, you can check into a “Hip Room” at Media One Hotel in Dubai Media City, bag yourself a night’s stay for Dhs500 per room, per night (plus another Dhs115 in taxes and municipality fees), and the hotel will reimburse you the room rate in food and beverage vouchers. The hotel says guests can redeem up to Dhs500 per day on food and beverages at any of the Media One-owned outlets, which include Qwerty, Café M, Garden on 8, The MED and The DEK on 8. On42 will also be included once it re-opens in July. Not included in the deal are Q43, the popular pool hall, as well as Mr. Miyagi’s – the Asian street food joint opening soon. So, for Dhs615 in total per room, per night, you’ll get a decent room in a top hotel along with Dhs500 to spend at a number of top-class restaurants. Get booking now! Dhs615. Until Thu Aug 31. Media One Hotel, Dubai Media City, www.myhotelreservation.net (04 427 1000). There are decisions to be made on this staycation. Decisions like whether you’ll use the free Dhs250 per night room credit on dining or at the spa. Tough call, but maybe you can debate it while sipping a mocktail in the infinity pool. From Dhs600 per room, per night. Until September 30. Nad Al Sheba, www.meydanhotels.com (04 381 3231). Sometimes the last thing you want to do after a great meal is hunt down a taxi and head home. That’s why this elegant JBR hotel is offering a complimentary night’s stay when you buy two iftar meals at its Oceana restaurant. Dhs215 (iftar meal per person). Until June 24. The Walk, JBR, www3.hilton.com (04 399 1111). Book a stay at this JLT property this month and you’ll get to enjoy 20 percent off the cost of your room, plus a free breakfast or suhoor and a late check-out. Prices vary. Until Jun 25. Cluster T, JLT, www.pullmanhotels.com (04 567 1100). UAE residents can get a pretty nifty little discount across all Address Hotels + Resorts properties across Dubai this summer. Whether it’s a chilled staycay at the Boulevard, Dubai Mall or Palace Downtown, bag yourself 20 percent off all dining at Emaar Hospitality Group restaurants. In addition to some cheaper eats, staycation packages include two complimentary tickets to a number of attractions, for every day you book – including Reel Cinemas and Dubai Aquarium & Underwater Zoo. You can also upgrade your staycation package for just Dhs150 extra, per room, night to stay at Address Dubai Marina, a great way to get away, but stay right in the thick of it. Prices vary. Ongoing throughout summer. Address Boulevard, Downtown Dubai (04 561 8888); Address Dubai Mall, Downtown Dubai (04 438 8888); Palace Downtown (04 428 8888); Address Dubai Marina (04 436 7777). There is more to this Sheikh Zayed Road hotel than being the home of the ever-popular Long’s Bar. Not that we really need much more. 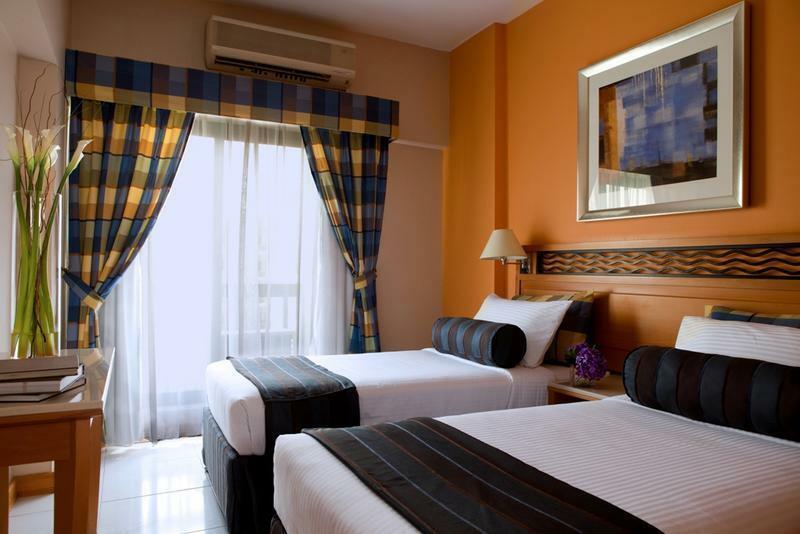 Check in and get 25 percent off the usual room rates and enjoy somebody else’s air-conditioning for a change. Dhs825 (new one-bedroom apartment). Until September 3. Towers Rotana, Sheikh Zayed Road, www.rotana.com (04 343 8000). Does it count as escaping from it all if the hotel you’re staying at looks directly back at your home? It does if, like this swanky LA import, it also provides theatrical style, adventurous glamour and cool hotel vibes. Cross your fingers for complimentary room upgrades (depending on availability at check-in) and make the most of a guaranteed 50 percent off spa treatments and 20 percent off at BLVD on One restaurant. From Dhs680 per room, per night. Until September 30. Palm Jumeirah, www.viceroyhotelsandresorts.com (04 455 9988). If you’ve never made the trek to Dubai’s highest viewpoint this is the summer to correct your mistake. When you check into a room at the low-rise Vida Downtown, you’ll get a couple of free passes to At the Top to complement your stay, along with a pair of Reel Cinemas tickets, too, so plenty to see. From Dhs599. Until September 30. Downtown Dubai, www.vida-hotels.com (04 428 6888). Thanks to attractions such as a stunning lagoon-style pool, restaurants including Bussola, El Sur and the famous Bubbalicious Friday brunch, and a prime stretch of beachfront, The Westin Dubai Mina Seyahi has become one of the city’s most popular beach hotels. There’s a good chance that you’ve visited before, but its Summer Madness promotion means that when you stay overnight, you’ll get 50 percent off food, beverages, spa treatments and watersports. From Dhs630 per room, per night. Until August 31. King Salman Bin Abdulaziz Al Saud Street, www.westinminaseyahi.com (04 399 4141). In a city of superlatives, it takes a stay at a humble art hotel in the historic neighbourhood to truly show Arabian charm and boutique style. We love just about everything about the arty hotel, and when you stay this summer, you get almost 50 percent of the usual room rate, plus free bike rental and 10 percent off at the café and off the cost of art for sale. Dhs300. Until August 31. Al Fahidi Historical Neighbourhood, Bur Dubai, www.xvahotel.com (04 353 5383). This elegant hotel has something for everyone, from classy restaurants and a wealth of shopping outlets in The Galleria (attached to the property) to superb views looking out onto Al Maryah Island. If you want to linger a little longer, when you book for two nights you get a third night for free. Prices vary. Until December 31. Al Maryah Island, Abu Dhabi, www.rosewoodhotels.com (02 813 5550). to spend in the hotel while you’re there. Not bad at all. Dhs500. Until September 3. 10th Street, Al Zahiya, Abu Dhabi, www.rotana.com (02 697 9302). A budget option that comes with a handful of activity passes and some onsite discounts – could you want more from a local escape? The hotel itself is not the swishest, but we really can’t fault the free tickets to Ferrari World and Yas Waterworld, buffet breakfast at Tamarind and a collection of further money-off promos on spa treatments, food, beverages and even theme park merchandise. From Dhs375 per room, per night. Ongoing. Capital Centre by Arjaan, Al Khaleej Al Arabi Street, Abu Dhabi, www.rotana.com (02 495 4444). Abu Dhabi’s plushest hotel is offering a 15 percent saving on rooms if you stay for at least two nights. As well as nosing around the palatial property, guests signing up for a summer staycation can do so on a half-board basis, meaning a daily breakfast for two and either lunch or dinner is available for a little stay-in-the-city pampering. From Dhs1,425 per room, per night (minimum two nights). Until September 30. West Corniche Road, Abu Dhabi, www.kempinski.com (02 690 9000). The 25 percent off food and beverages isn’t the greatest thing about a staycation here. Nor is the 20 percent of saving on all spa treatments – although, they come close. No. It’s the fact that this is a sub-Dhs400 five-star hotel deal on the attractive Raha beachfront that lets you have everything you could want from the perfect staycation. From Dhs395 per room, per night. Until August 31. Channel Street, Abu Dhabi, www.danathotels.com (02 508 0555). From Dhs399 per room, per night. Until August 31. Dhafra Beach, Abu Dhabi, www.danathotels.com (02 801 2222). How would you describe your perfect weekend? Well, how about a stroll on a private sandy beach, unrivalled views of the iconic Sheikh Zayed Grand Mosque and lunch enjoyed by the pool? If that’s pretty close to the mark, check in for the 36-hour weekend package at Fairmont Bab Al Bahr. Highlights include a poolside lunch for two, breakfast and a late check-out at 6pm. From Dhs1,699 (for two). Until December 31. Khor Al Maqta, Abu Dhabi, www.fairmont.com (02 654 3333). If you’re staying in the UAE over the hotter months, you probably like a little sizzle with your summer. So, a special offer that gives you Dhs555 credit at one of Abu Dhabi’s finest steakhouses should be right up your street. See what we did there? When not eating in 55&5th, The Grill, you can use the spa, pool and watersports facilities to work of the meat feast, while the little ones go wild in the kids’ club. From Dhs699 per room, per night. Ongoing. Saadiyat Island, Abu Dhabi, www.stregissaadiyatisland.com (02 498 8888). You must have noticed that there is very little you can do for Dhs249. So, when you find a hotel that lets you stay overnight, have breakfast for a family of four and try a resort activity such as desert cycling or sandboarding and still give you change, albeit negligible, from Dhs250, you should take note. Especially when it also offers 25 percent off food, drink and massages. From Dhs249 per room, per night. Until August 31. Madinat Zayed, Abu Dhabi, www.danathotels.com (02 894 6111). They’re calling this a playcation and it’s easy to see why. The Radisson’s summer offer is bundled with Yas Waterworld and Ferrari World access. Life, though, is not all play. On a positive note, that does leave you more time for the free Yas Beach access and buffet breakfast. From Dhs499 per room, per night. Until September 30. 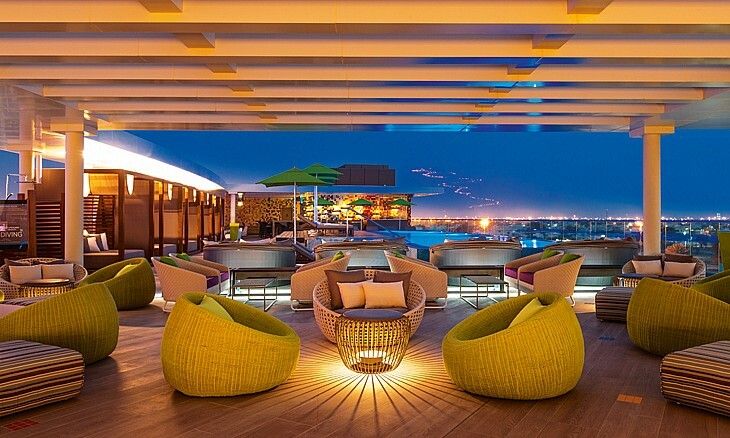 Yas Island, Abu Dhabi, www.radissonblu.com (02 656 2000). Turn Yas Island into adventure island with free access to two of the jewels in the busy area’s crown, Ferrari World and Yas Waterworld, when you stay at the hotel for two nights or more. From Dhs499 per person, per night. Until September 30. Yas Island, Abu Dhabi, www.radissonblu.com (02 656 2000). We quite like the idea of putting down roots and staying more than just a night or two in a city hotel, so the Sheraton’s Linger Longer for Less offer is a campaign we like. Stay for three nights and you’ll be given a fourth free. Or, in real terms, five days and four nights for as little as Dhs267 per night. Not bad when you look at the sandy lagoon and collection of swimming pools to luxuriate alongside. Dhs1,070 (four nights). Ongoing. Corniche Road, Abu Dhabi, www.sheratonabudhabihotel.com (02 677 3333). There are plenty of options for a staycation deal at The St. Regis Saadiyat Island Resort, Abu Dhabi. Spa-and-stay packages at the Iridium Spa include a night’s stay, plus a 60-minute, full-body massage per day, while dining packages include a complimentary breakfast and generous credit vouchers for the various food and beverage outlets across the resort. Additional pool and beach access deals include complimentary dining coupons and a free 30-minute watersports activity. Prices vary. Ongoing. The St. Regis Saadiyat Island Resort, Abu Dhabi (02 498 8888). Why travel abroad when there’s a spaceship in Abu Dhabi where you can say. Well, perhaps not strictly a spaceship, but a very futuristic hotel. There are a few offers, with a great UAE residents’ deal being one of the best. Splash out a little bit more and there you get a choice of free tickets to either Yas Waterworld or Ferrari World, or dining credit worth Dhs300 for use in the hotel’s restaurants. Dhs515 (residents’ offer), Dhs624 (dining offer) Dhs924 (parks offer). Until September 30. Yas Island, Abu Dhabi, www.viceroyhotelsandresorts.com (02 656 0700). Fancy a getaway to The Garden City of the UAE? Al Ain’s high-tech new hotel is making it easier for the whole family to have relaxing break, without having to empty the savings account, thanks to a great offer whereby kids up to 12 can eat for free and parents get 50 percent off a second room for kids and young adults up to the age of 21. Prices vary. Ongoing. Hazza Bin Zayed Stadium Development, Al Ain, www.alofthotels.com (03 713 8891). It’s only a couple of hours’ drive from Dubai, but any stay on the East Coast feels like a proper holiday escape. We like this upmarket hotel near the top diving spots of Al Aqah and with a buffet breakfast and buffet dinner at Views it’s a resort you won’t need to stray far from. The rates are cut-price and for every two nights booked there’s a third free. From Dhs695 per room, per night. Until September 30. Al Aqah, Fujairah, www.lemeridien-alaqah.com (09 244 9000). This is simply great value. Close to attractions such as the historic fort and castles that are popular in the east coast Emirate, as well as having an outdoor pool and spa on site, this is an interesting base for exploring a new part of the UAE. But, best of all, it is really friendly on the wallet. From Dhs210 per room, per night. Until September 15. Haleefat Area, Hamad Bin Abdulla Road West, Fujairah, www.millenniumhotels.com (09 201 2000). you book the Romance Package in Fujairah. With flowers and chocolates in your room, a three-course dinner, breakfast served by a butler and, somewhat less romantic but important nevertheless, free wi-fi, this is a chance to enjoy a weekend away with a loved one without the stress of airports. From Dhs999 per room, per night. Ongoing. Al Aqah, Fujairah, www.radissonblu.com (09 244 9700). The hotel’s all-inclusive offer could be one of the best value promotions in the UAE this summer. Particularly for anyone who likes buffets and kayaking. The Ras Al Khaimah resort manages to shoehorn in three buffet meals, unlimited drinks, free kayaking and beach access, all for less than Dhs400. With early check-in you can stretch a single night here out to a lot of entertainment. Dhs399 per room, per night. Ongoing. Al Jasirah, Al Hamrah, Ras Al Khaimah, www.binmajid.com (07 243 4421). We’re not going to try and pass this off as a budget stay, but boy is it swanky. And cheaper than it would normally be, so we’re still calling it a deal. Get 20 percent off the room rate, a daily breakfast at Al Waha, 30 percent off food and drinks and a voucher for future discounts at any Marriott hotel in the Middle East and Africa. With the price comes knowledge that you’re staying in a private pool villa in one of the most luxurious desert resorts in the land. Dhs1,764 per room, per night. Until August 31. 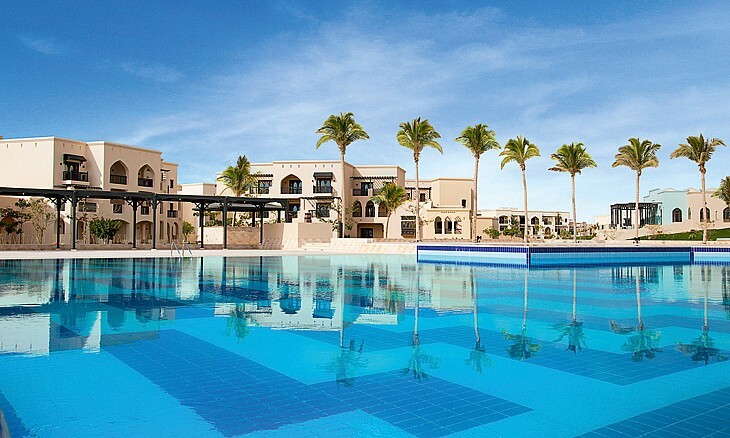 Al Mazraa, Ras Al Khaimah, www.ritzcarlton.com (07 206 7777). You could travel a very long way to find a beach significantly less impressive than the 600 metres of the Cove’s. Outdoor infinity pools, watersports and a few restaurants are enough to keep families, groups of friends and single travellers busy and entertained throughout their stay. And to celebrate its 25th anniversary, guests will get 25 percent off the best available rate this summer. Prices vary. Until September 3. Sheikh Mohammed Bin Salim Road, Al Dhaith South, Ras Al Khaimah, www.rotana.com (07 206 6000). Children stay free and get free breakfast, lunch and dinner at this resort. They’ll also be able to use the kids’ and arcade zone or just play about on the extensive beach and in the outdoor playgrounds. From Dhs599 per room, per night. Until October 8. Marjan Island Boulevard, Ras Al Khaimah, www.hilton.com (07 203 0000). Dhs280 per room, per night. Until October 8. Bin Daher Street, Ras Al Khaimah, www.hiltongardeninn.com (07 228 8888). Ras Al Khaimah’s archipelago of manmade islands will be central to its tourism for many years to come, and if you’ve yet to visit Marjan Island, this summer could be your chance to catch up. Not only are kids being well catered for with a packed evening schedule, there’s also nightly cinema and events for young ones, to let you simply relax. Dhs395. Until September 30. Marjan Island Boulevard, Ras Al Khaimah, www.marjanislandresort.com (07 203 5555). For so long a penguin-themed waterpark was the greatest highlight out in these parts. But the past few years have seen some top-notch resorts open that make short breaks in RAK all the more enjoyable. The Waldorf Astoria is an excellent recent addition, with 350 metres of private beach and impressive mountain and sea views. This summer, the hotel is offering 20 percent off room rates and both breakfast and dinner at its restaurants that make a trip to RAK more sense than ever before. From Dhs1,020 per room, per night. Ongoing. Vienna Street, Ras Al Khaimah, www.rotana.com (07 203 5555). Explore the great outdoors at this 1,235-acre reserve. Gather survival skills, learn about rare species out in the desert, go on a camel caravan or just chill out in your private pool. From Dhs2,000 per villa. Al Wadi Desert, Ras Al Khaimah, www.ritzcarlton.com/en/hotels/uae/al-wadi-desert/offers. Chill out on a 600-metre, pristine white beach at the Cove Rotana Resort. Located on the a water inlet of the Ras Al Khaimah beachfront, stare endlessly at the Arabian Gulf, play some watersports, dip in one of the two infinity pools, or just hang out in your villa. From Dhs600 per room, per night. Cove Rotana Resort, Ras Al Khaimah, www.rotana.com. Eating your way through the summer isn’t a bad idea. The Waldorf Astoria has nine cracking restaurants and lounges to explore, temperature-controlled pools, kids’ club and a spa featuring floatation beds. From Dhs825 per room, per night. Waldorf Astoria, Ras Al Khaimah, www.waldorfastoria3.hilton.com. Make full use of the kids’ club, grab your clubs and go play a round at the 18-hole championship course. There are also six different food and beverage outlets to explore after the round, and watersports facilities on-site to help you unwind. From Dhs489 per room, per night. Hilton Al Hamra Beach & Golf Resort, Ras Al Khaimah, www.hilton.com. Two paying adults will get one child pass for free until the end of September at Iceland Waterpark (Dhs175 per person, www.icelandwaterpark.com), Fly Fish Water Sports (prices vary, www.flyfish.ae), Adventure Sports Water Sports (prices vary, www.adventuresports.ae), Sea Wings seaplane ride from Ras Al Khaimah to Dubai (Dhs1295 per person, reservations@seawings.ae). One of the UAE’s most popular pastimes is Bedouin-style desert camping. Bedouin Oasis Desert Camp is offering a desert dinner, with a dune bashing safari for an extra Dhs300. From Dhs120 per person. The Bedouin Oasis, Ras Al Khaimah, arabianincentive.com/Bedouin-Oasis.aspx. The Pirates Club at Marjan Island Resort & Spa offers a chance to really treat the kids to a fun-filled, action-packed programme involving cookery classes, boat races, water football and other pool-based watersports at this five-star resort. Crash out in front of a movie at the kids’ cinema at the end of the day. Dhs395 per room per night. Marjan Island Resort & Spa, www.marjanislandresort.com. Teens Republic will keep the teenagers happy all weekend, with ten- to 17-year-olds able to join in with tournaments on X-Box or PlayStation consoles, pool tables, dart boards, table football or Jenga. Meanwhile, parents can enjoy any of the eight restaurants on offer, swimming pools, spas and more at this luxury resort. Dhs1,200 per room, per night. Rixos Bab Al Bahr, Al Marjan Island, Ras Al Khaimah, www.babalbahr.rixos.com. There are lots of treatments available for a chilled weekend away, but start off by relaxing on the 450-metre private beach, before taking a dip in any of the seven outdoor heated pools, or an indoor ladies-only pool. Have a quick workout, or head straight to one of the two spas that feature nine treatment rooms, sauna, steam and whirlpool options. There are also 13 food and beverage outlets to explore. From Dhs599 per room, per night. DoubleTree by Hilton Resort & Spa Marjan Island, Ras Al Khaimah, www.doubletree3.hilton.com. Dubai Season Copyright © 2019.